Have Questions? live Chat with us. 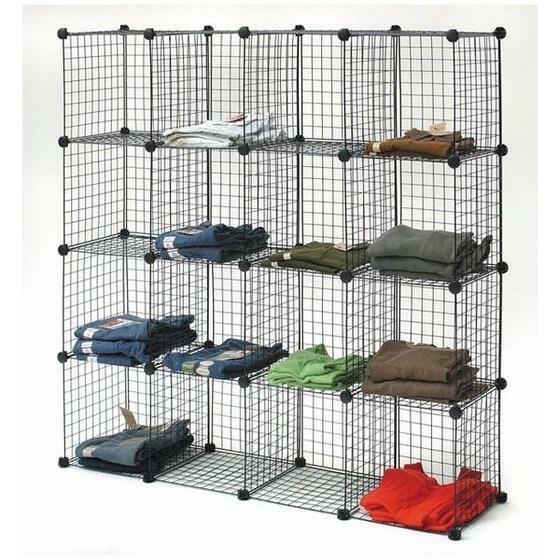 Our most popular colored, plastic coated metal grid cubbies units. All units use 3/16" plastic coated metal and plastic connectors. This unit uses 10" x 16" black vinyl covered metal grid to create a great display for shirts,etc. Closed back unit. Uses 14" x 14" back panel for each cubbie. All parts included with each unit. Back to back units are available in black or white. Call for pricing. 4" high x 4" wide units, 16 cubbies with backs. Choice of open back and closed back units. D Units: 10" x 16" cubbie for shirts. E Units: 14" x 14" cubbie for sweaters. Please note: Truck shipment is required for this product. Signup to receive specials & promotions. © 2019 American Hanger. All Rights Reserved. Website by Hudson.